I need my Insurance Company quick! 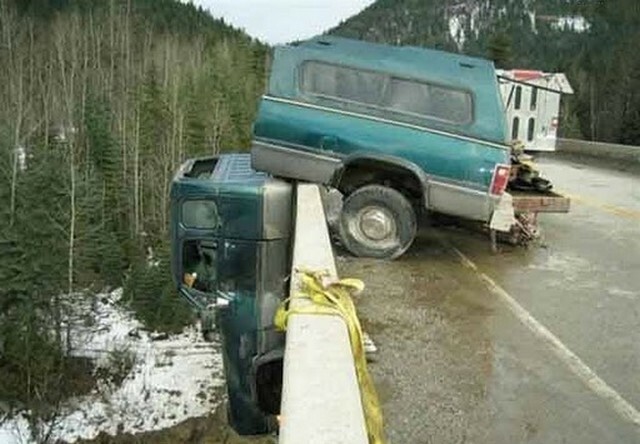 There are two sides to every story when accident-prone drivers fill out insurance claims. The following explanations were taken from actual insurance forms. • The other car collided with mine without giving warning of its intentions. • The pedestrian had no idea which way to run, so I ran over him. • I collided with a stationary truck coming the other way. • A truck backed through my windshield into my wife’s face. • A Pedestrian hit me and went under my car. • The guy was all over the road; I had to swerve a number of times before I hit him. • In my attempt to kill a fly, I drove into a telephone pole. • I had been driving for 40 years when I fell asleep at the wheel and had an accident. • To avoid hitting the bumper of the car in front of me, I hit the pedestrian. • My car was legally parked as it backed into the other car. • An invisible cat came out of nowhere, struck my car, and vanished. • I told the police that I was not injured but on removing my hat I found that I had fractured my skull. • I thought my window was down but I found out that it was up when I put my head through it. • I saw a slow moving, sad-faced old man as he bounced off the roof of my car. • The indirect cause of the accident was a little guy in a small car with a big mouth. • I was thrown from the car as it left the road. I was later found in a ditch by some stray cows. • The telephone pole was approaching. I was attempting to swerve out of its way when it struck the front end of my car. • I was on the way to the doctor with rear-end trouble when my universal joint gave way causing me to have an accident. It is such a delight and privilege to share each week with you, I call my friends. I thought I would share what is happening in my life this last month. As many of you know I have been struggling with pain after my fall, and the doctors have been trying to find the cause. Last week after reviewing an ultrasound they sent me for a CT scan and found a mass. I will be going for surgery possibly next week. I would ask that you remember me in prayer this month and I will keep you up–to-date. Even this week God is showing me His love, comfort and how His timing is perfect in all things. In a matter of days I have been able to get an appointment with a specialist and surgeon, which I know is under God’s guidance and control. I know God’s plans are perfect and with each plan He has a purpose. And when God has a purpose for our lives He gives us promises too. Have a great weekend sending love and hugs to you. Previous Post: Fifty Shades of Brokenness? Next Post: 33 Outfits Out of a small overnight bag. everything else into perspective. Thank you for sharing with us so we can pray and see and experience God’s amazing power at work.